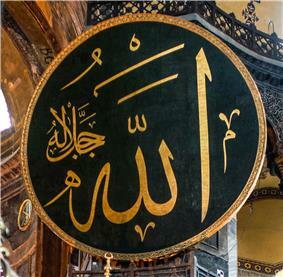 Tawhid (Arabic: توحيد‎ tawḥīd, meaning the oneness [of God]"; also transliterated as Tawheed and Towheed) is the indivisible oneness concept of monotheism in Islam. Tawhid is the religion's most fundamental concept and holds that God (Allah, literally Al-Ilāh "the God") is One (Al-ʾAḥad) and Single (Al-Wāḥid). Because of the "principle of Tawhid the Islamic belief in God is considered Unitarian." Tawhid constitutes the foremost article of the Muslim profession of faith. The first part of the Shahada (the Islamic declaration of faith) is the declaration of belief in the oneness of God. To attribute divinity to a created entity, known as shirk, is an unpardonable sin according to the Qur'an. Muslims believe that the entirety of the Islamic teaching rests on the principle of Tawhid. There is an uncompromising monotheism at the heart of the Islamic beliefs (Aqidah) which is seen, from an Islamic standpoint, as distinguishing Islam from other major religions. However, Tawhid is analogous to the monotheistic concept of God in Judaism as declared in the Shema (the Jewish declaration of faith), and is also analogous to Christian Unitarianism adhered to by a minority of Christian denominations affirming the oneness and indivisibility of God in Christianity (in contrast to the "One God in Three Persons" Trinity of most Christian faiths). The classical definition of tawhid was limited to declaring or preferring belief in one God and the unity of God. Although the monotheistic definition has persisted into modern Arabic, it is now more generally used to connote "unification, union, combination, fusion; standardization, regularization; consolidation, amalgamation, merger;". According to Edward Lane's Lexicon on classical Arabic, Tawhid is an infinite noun that means "He asserted, or declared, God to be one; he asserted, declared, or preferred belief in the unity of God" and is derived from the Arabic verb "wahhada," which means "He made it one; or called it one." In modern Arabic, the verbs "wahhada" or "yuwahhidu" mean "to unite" or "bring together" something that which wasn't one, which reflects the struggle of monotheism against polytheism. In order to explain the complexity of the unity of God and of the divine nature, the Qur'an uses 99 terms referred to as "Excellent Names of God" (Sura 7:180).The divine names project divine attributes, which, in turn, project all the levels of the creation down to the physical plane. Aside from the supreme name "Allah" and the neologism al-Rahman (referring to the divine beneficence that creates and maintains the universe) and a few other specific names like al-Maalik al-Mulook ('King of Kings' in an authentic narration of the Prophet), other names may be shared by both God and human beings. According to the Islamic teachings, the latter is meant to serve as a reminder of God's immanence rather than being a sign of one's divinity or alternatively imposing a limitation on God's transcendent nature. Attribution of divinity to a created entity, shirk, is considered a denial of the truth of God and thus a major sin. Allah is the progenitor of all things, both good and evil. As is written in the Qur'an, all of humanity is created at the will of Allah, both the good and the evil; and that their natures have been predisposed as such since the beginning of creation. According to Sunni Islam, the orthodox understanding of theology is taken directly from the teachings of the Prophet with the understanding and methodology of his companions, sourced directly from the revealed scripture the Qur'an; being the main information source for understanding the oneness of God in Islam. All Muslim authorities maintain that a true understanding of God is impossible unless He introduces Himself due to the fact that God is beyond the range of human vision and senses. Therefore, God tells people who He is by speaking through the prophet. According to this view the fundamental message of all of the prophets is "There is no god but God." Tawhid means the unity of the names and attributes of Allah. Shirk means the unity of creation with Allah, that is a great sin in Islam. Both words, tawhid and shirk, mean to unite or to associate, but are used in different context. According to Seyyed Hossein Nasr, Ali, the first Shia Imam and fourth Sunni caliph, is credited with having established Islamic theology and his quotations contain the first rational proofs among Muslims of the Unity of God.